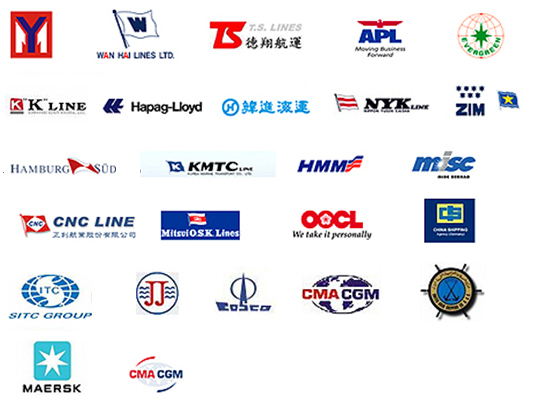 • Dolphin Logistics Co.Ltd & Oversea sea freight agency network with over 300 points for global groupage service. • Dolphin set up branches and representative offices and work with overseas air/sea/courier/logistics agents which total over 350 service locations to provide best service to meet your demands. • Dolphin has good relationship & has competitive rate with world well-known carriers, to provide variety freight & services. Dolphin can provide you door-to-door services that included customs clearance, inland transportation, seafreight…etc. Client should authorize Dolphin to handle all processing. Dolphin can get cross trade business freight at any point. Dolphin can get competitive rate basic on good quantity to increase client’s competition. • To coordinate with nowadays complex trading patterns, Dolphin has specialized forwarding employees with strong trade concept to handle your requests: Cross Trade cargo, receiving cargo, issuing B/L, paying amount, collecting amount, distributing cargo, inspecting cargo…etc. Dolphin can act as your representative agent. You don’t need to set up office & trade company, Dolphin handle your cargoes. Meet with client & understand their demand. Set up service group with professional sales, financial, senior OP, CS, IT & manager. Make SOP procedures & execute. Understand your demand and active trace procedures. Find out problem and improve. Dolphin co-operates with experienced customs broker to provide professional customs service in Taiwan, China, Europe, Asia & USA. －General Air/Sea freight Import/Export customs. －Bonded cargo declaration, transit cargo declaration. －No matter charter trucking service or consol truck service, Dolphin all can provide customizes service to meet your demand. • Dolphin Logistics Co.Ltd oversea network with over 500 points seafreight consolidation service. Such as Hong Kong, Xiamen, Shenzhen, Shanghai, Quanshan, Nanking, Tainjin, Qingdao, Dalian, Dubai, Colombo, South Africa, Japan, Korea, Indonesia, Vietnam, Singapore, Philippines, Thailand, USA, Canada, Australia, New Zealand, Europe main points…etc. • We are the only company in all Taiwan providing direct consol service Taiwan-Vladivostok without re-stuffing from one container to another container in Pusan, S.Korea as all other freight-forwarders do, which exclude any risk to damage/loose cargo and prevent transit inspection. • All processing stages link up with network & joint factory, let your cargo can arrive client place safety. Door-to-Door service integrated with trucking, brokerage, seafreight, carriers, warehouse…etc so that your cargo arrives at final destination on time & safe! Strict & completed transportation monitoring & control to avoid any additional charges and delays.